Now, this is something you don’t see everyday! Newly single Jennifer Aniston and semi-newly single The Weeknd got close for a cute photo op at Ellen DeGeneres’ star-studded birthday party! 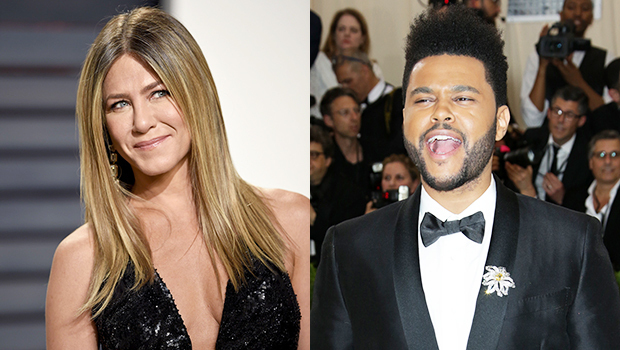 Who knew Jennifer Aniston, 49, and The Weeknd, 28, were pals! The actress and the singer touched heads as they got close for a photo at Ellen DeGeneres‘ star-studded birthday bash over Valentine’s Day weekend. The photo — posted to Instagram by a fellow party goer, Stephanie Allynne — has garnered some attention for how close Aniston and The Weeknd appear in the snap. As you may know, Selena Gomez, 25, is the ex-girlfriend of The Weeknd and she’s also friends with Aniston. And, although Gomez isn’t dating The Weeknd any longer, some fans have questioned if she should have some sort of an opinion about her friend hanging out with her ex.